Rhett Jones reports in Gizmodo that on Wednesday, November 15, 2017, auction records were shattered when an anonymous buyer spent $450.3 million to be the proud owner of a “long lost” painting “by” Leonardo da Vinci. The thing is, it may not have even been painted by Leonardo, it’s in terrible shape, it’s not especially good, but in the financial world of art, none of that matters. 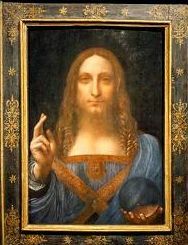 Christie’s auction house has been hyping the emergence of Salvator Mundi (“Savior of the World”) as “the greatest and most unexpected artistic rediscovery of the 21st century.” It’s believed to be the only Leonardo in private hands. According to Artnet, it was once part of the collection of King Charles I and has since bounced around less prestigious homes. In 1958, it was auctioned at Sotheby’s London for £45 and attributed to Boltraffio, a painter who worked in Leonardo da Vinci’s studio. It was then picked up at an estate sale for around $10,000 back in 2005. In the last decade, researchers and authenticators have studied its history and deemed it an authentic Leonardo. The opening bid was set at $100 million and Christie’s reportedly wondered aloud if some collector could conceivably drop $2 billion on it. If the auction house truly thought that was a possibility, I guess they were a little disappointed by the final hammer price. But that $450.3 million is by far the highest price paid for a painting at auction. The previous record holder was Pablo Picasso’s Les Femmes d’Alger, which sold for $179,364,992 in 2015. The Guardian claims Salvator Mundi is also the highest priced artwork ever sold privately, but that record is a lot harder to definitively establish because artworks change hands without public records all the time. Not everyone, however, is sure that this record-breaking painting is by Leonardo da Vinci. Authentication is a subjective trade, and a buyer’s confidence in an authenticator’s assessment is mostly based on that authenticator’s reputation. In the case of Salvator Mundi, it was being restored by Dianne Dwyer Modestini, a professor of paintings conservation at New York University, in 2007 when she started having a feeling that something was different about this piece. She was commissioned to clean up what she thought was a copy of the famous Florentine’s work but began to see details that were very Leonardo-like. A subsequent X-ray revealed traces of changes being made to the composition over time. Someone making a copy wouldn’t be making these drastic changes. Since then, many top scholars have concluded that it is, in fact, a Leonardo based on numerous factors including the technique, materials, and outside historical data. The painting is absolutely dead. Its surface is inert, varnished, lurid, scrubbed over, and repainted so many times that it looks simultaneously new and old. Experts estimate that there are only 15 to 20 existing da Vinci paintings. Not a single one of them pictures a person straight on like this one. There is also not a single painting picturing an individual Jesus either. All of his paintings, even single portraits, depict figures in far more complex poses. Even the figure that comes remotely close to this painting, Saint John the Baptist, also from 1500, gives us a turning, young, randy-looking man with hair utterly different from and much more developed in terms of painting than the few curls Christie’s is raving about in their picture. Writing for the New York Times, art critic Jason Farago agrees that this is not the “Male Mona Lisa” it’s been advertised to be. Authentication is a serious but subjective business. I’m not the man to affirm or reject its attribution; it is accepted as a Leonardo by many serious scholars, though not all. I can say, however, what I felt I was looking at when I took my place among the crowds who’d queued an hour or more to behold and endlessly photograph “Salvator Mundi”: a proficient but not especially distinguished religious picture from turn-of-the-16th-century Lombardy, put through a wringer of restorations. I’m not saying that this isn’t Leonardo. I’m also not saying that it is a Leonardo. I’m actually saying that it’s a kind of incoherent question to ask. It’s kind of like asking, “Is the moon Jewish, or is the sun gay?” Pictures, even today (let alone in the 16th century), can be all sorts of things between being by a great master and being by some assortment of assistance. Art brings in huge prices because it carries cultural cachet, looks good in your home, offers access to high society, and above all, is a very convenient way to park some money. High-priced art is often used for money laundering, but even in legitimate circumstances, it’s just another way to diversify the ways in which your money is being stored if you’re an extremely rich person. And hey, it goes up in value all the time. Speaking of extremely rich people, who paid for this? We don’t know, and if the buyer doesn’t want to say, we may never know. Liu Yiqian, a Chinese billionaire, was rumored to be the buyer, but he told The New York Times it wasn’t him. Another possibility is Bill Gates. He did pay $30 million for Leonardo’s journals back in 1994. But that’s the story with this piece. We don’t know for sure that it’s authentic, we don’t know that it’s any good, and we don’t know who bought it. We just know that some people decided it was worth a buttload of money. And so it is. Note EU-Digest: This report really shines a direct light on how decadent our so-called "Western Values" have become, when someone can spent close to half a billion dollars on a possibly fake da Vinci painting, and this while millions of children are dying as a result of famine, wars and other calamities, many of which the direct results of those same "Western Values".